Arizona has elected its first female senator, after Democrat Kyrsten Sinema beat Republican Martha McSally in a tight race. 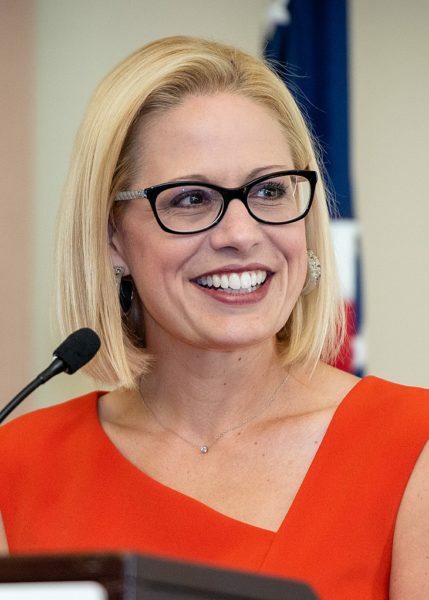 Kyrsten Sinema, 42, is Arizona’s first Democratic senator since 1994. The win narrows the Republican majority to four seats (51-47), with two more Senate races remaining unresolved. In Florida, a recount has been ordered by law after unofficial results fell within a 0.5% margin. Mississippi will hold a run-off vote later this month. With almost all the votes counted, Kyrsten Sinema had a lead of 1.7% of her rival. She now becomes Arizona’s first female senator. Kyrsten Sinema later addressed her cheering supporters in Phoenix, speaking of the urgent need to heal the bitter political rancor dividing Americans. Martha McSally, a former combat fighter pilot, conceded defeat. Florida Secretary of State Ken Detzner has ordered that all 67 of the state’s counties complete machine recounts for the Senate by 15:00 local time on November 15. Brian Kemp declared victory on November 7 with a narrow lead but campaign officials for Stacey Abrams have started a legal challenge to ensure all votes are counted. Stacey Abrams’ supporters have claimed that issues such as ballot machines supplied without power cables and four-hour queues unfairly helped Brian Kemp. An ongoing tally has whittled Brian Kemp’s lead slightly to under 60,000 votes, the Atlanta Journal-Constitution reported on November 11. However, Stacey Abrams still needs another 22,000 votes to trigger a run-off election next month, and it is unclear how many ballots remain outstanding. The Mississippi vote will take place on November 27.